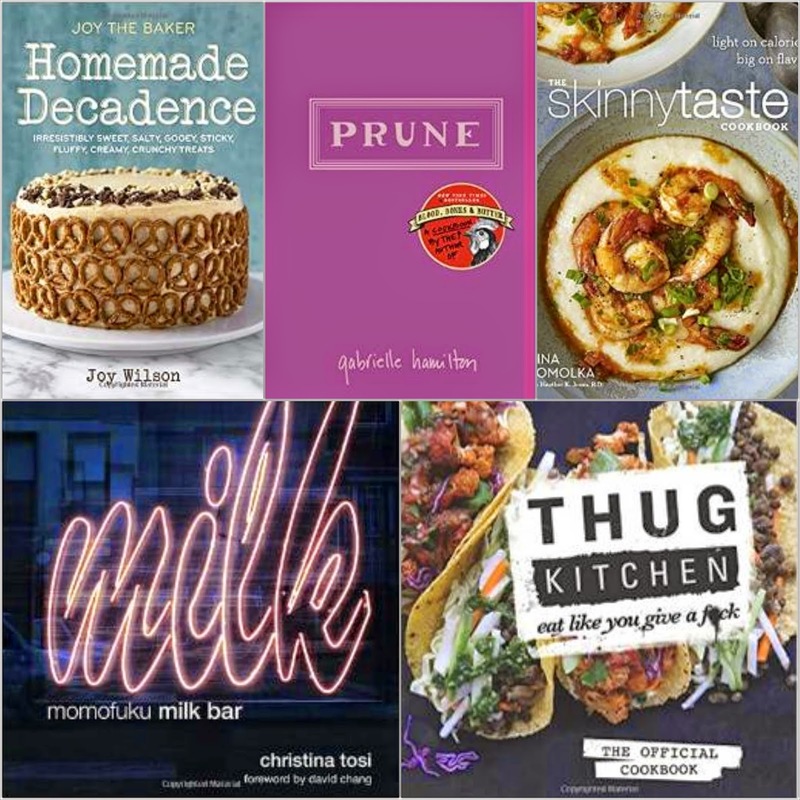 heather & olive: cookbook wishlist. Homemade Decadence by Joy Wilson (aka Joy the Baker). I love reading Joy's blog for both recipes and anecdotes, and I don't think her cookbook would disappoint. Apple pie with cheddar-bacon crust? Bourbon chocolate pecan pie bars? Brown sugar cream cheese ice cream? Sign me up. Prune by Gabrielle Hamilton. I loved Gabrielle's memoir, and while I haven't been lucky enough to eat at her restaurant, I'm up to the challenge of creating her recipes at home. The Skinnytaste Cookbook by Gina Homolka. I've heard nothing but good things about this book--embarrassingly, I only recently started reading her blog but with bathing suit season rapidly approaching I'm going to need start incorporating these recipes into my weekly dinner plans ASAP. Milk by Christina Tosi. Bathing suit season aside, I think everyone needs compost cookies, crack pie and birthday cake in their life. Thug Kitchen: The Official Cookbook by Thug Kitchen. I never thought I would be adding a vegan cookbook to my wishlist, but this looks too good. Yet another cookbook based on a blog, it melds healthy eats like miso noodle soup and cauliflower tacos with profanity. What's not to love? I have been meaning to get the Skinnytaste one... love that blog!